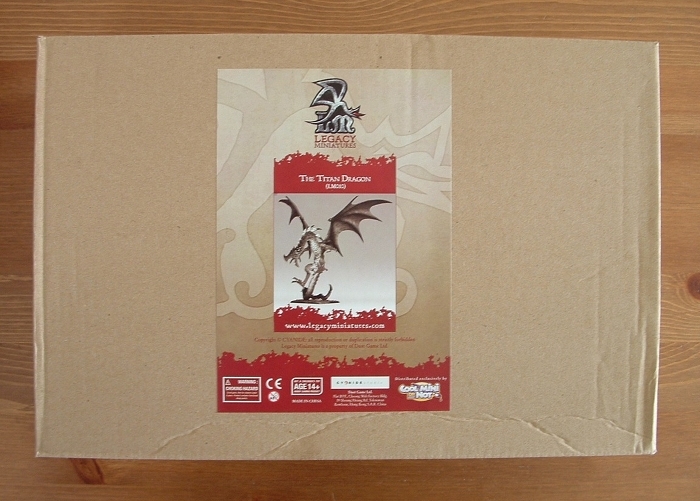 The Titan Dragon is the largest of the (re-)releases of ex-Rackham miniatures from Legacy Miniatures via their exclusive distributor: Coolminiornot. It is cast in resin and comes with the 6 cards you’d need to play it in Confrontation 3, not that I expect you’d see it in a game very often. At 750 points it’s much more pokey than a normal 400 point warband could dream of coping with (and I had a good giggle to myself reading the unholy carnage it can wreak). I suppose you could have a game with one player taking the Dragon and two more taking a normal warband each. That might be fun. Rich? Are you reading this? In reality though, it was designed for people to coo and marvel at, collectors to covet and occasionally someone to stick in a game of Rag’narok. Oh, and people to tut about the price. It’s never been either widely available or cheap, although it rose in value in the gap when you couldn’t get them, so perhaps the European governments should invest in them instead of dubious banks that keep falling over. 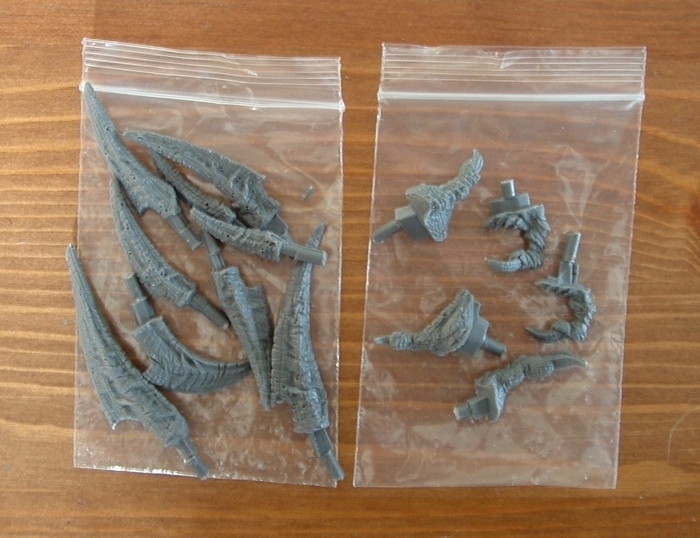 There are lots of bits of grey resin, nestled in their own carefully shaped clear plastic containers. I’ve read that Legacy Miniatures are something to do with Paolo Parente and use the same sort of production chain as DUST. The style of packaging and feel of quality would certainly support that. The contents break down into two trays of bits. The first has the head, body and limbs in several pieces. The second has the wings, the base and two little packets of spiky bits, claws and the odd thumb. Unfortunately there were a couple of extra separate bits where a couple of the wing claws had been bashed about in transit and broken off. The breaks aren’t terrible as they’re clean and I’ve got the bits, so they’ll glue back simply enough. Not worth fretting over. If the claws had been separate in the first place I’d just have glued them on anyway, so it’s fine. The wings themselves are covered in detail and are huge. 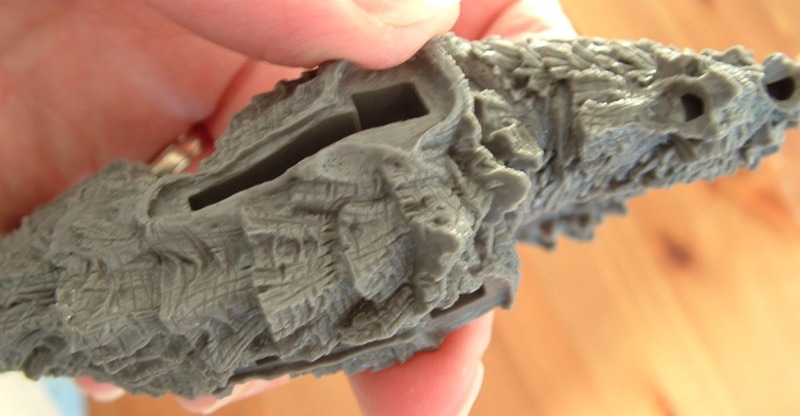 In fact, the whole thing is highly detailed, with sometimes very different textures on different parts. The sculptor clearly thought quite carefully about this. 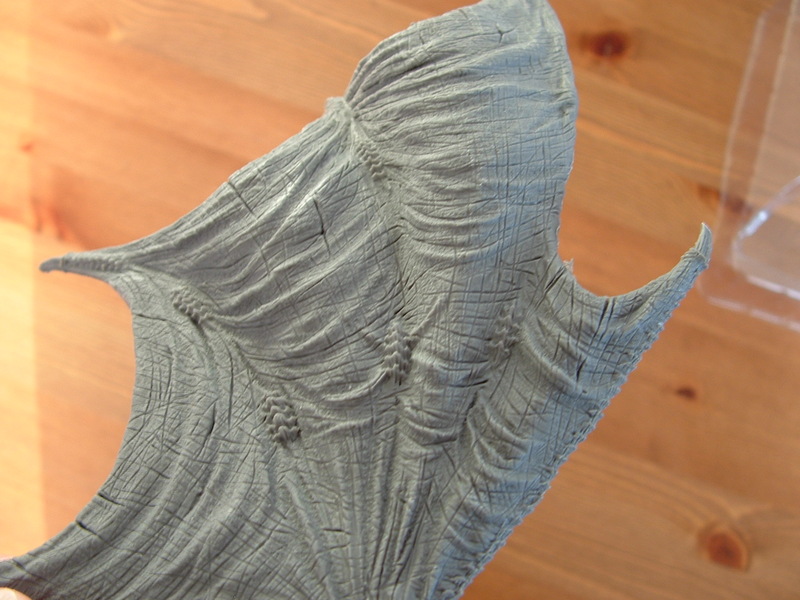 There’s all manner of tiny details lurking in the folds and plates when you look closely. I’ve tried to use different lighting on each picture below to give you a wider spectrum of definition. Three-quarter view of the belly of the beast. Top down view of the back. One of the arms. I think this one has a separate thumb to be added. 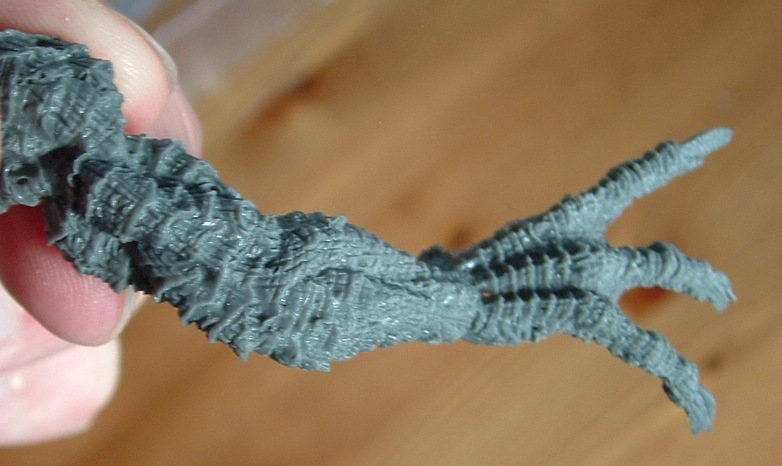 The claws/hands are enormous for a 28mm scale model. 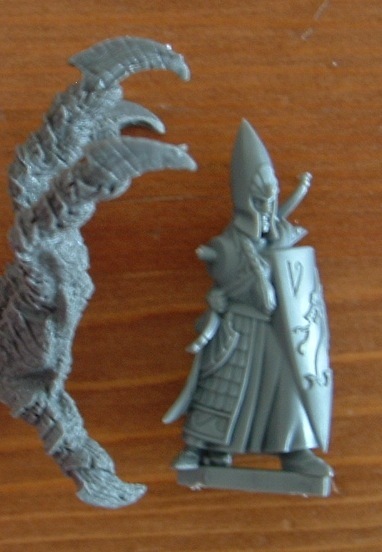 Here’s one of the High Elves from the Island of Blood as a size comparison. Look out behind you! Even though the focus is a little fuzzy, you can see the level of detail on the Titan Dragon compared to the High Elf (and he’s a nice figure). The scoring, scarring and heavily textured skin of the Dragon makes him look aged and grizzled like he’s been through a thousand battles before you turned up. Or just that he never moisturises. In the picture below you can see the claw in action again, showing how well scaled it is (get it) for stomping little guys. 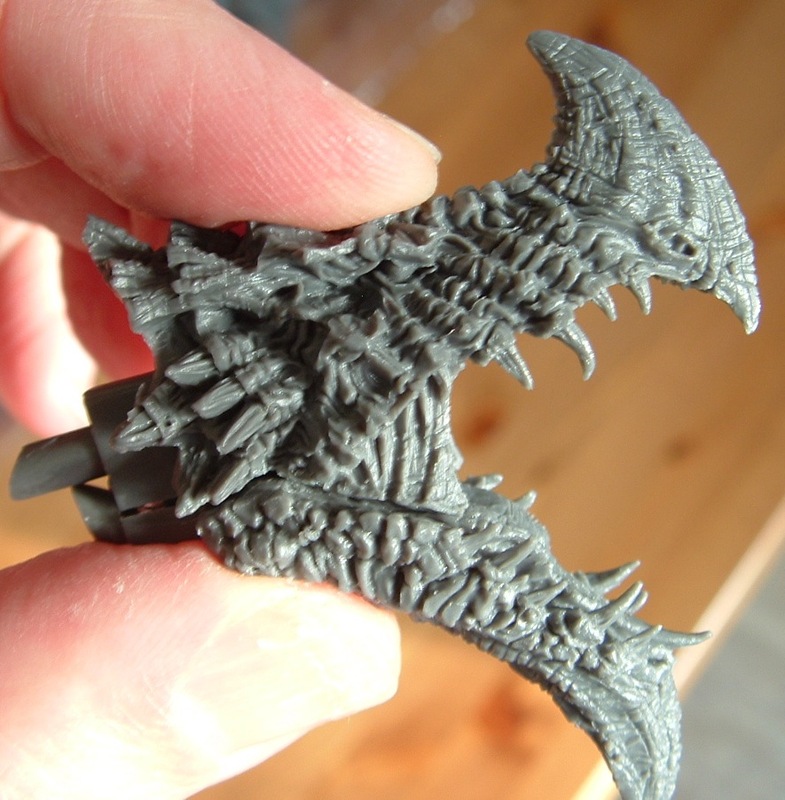 Again, it’s a good comparison of the sort of detail you get all over the Titan Dragon against a Games Workshop Warhammer standard. While we’re looking at bits of detail, you may have noticed that the joints are all different funny shapes. This is to ensure that you don’t assemble things wrong, and also gives a solid key to each piece. What’s also good is that most if not all of the pouring blocks are onto these joints, so that they don’t obscure any detail when they are removed. Speaking of casting quality, it’s very high indeed. 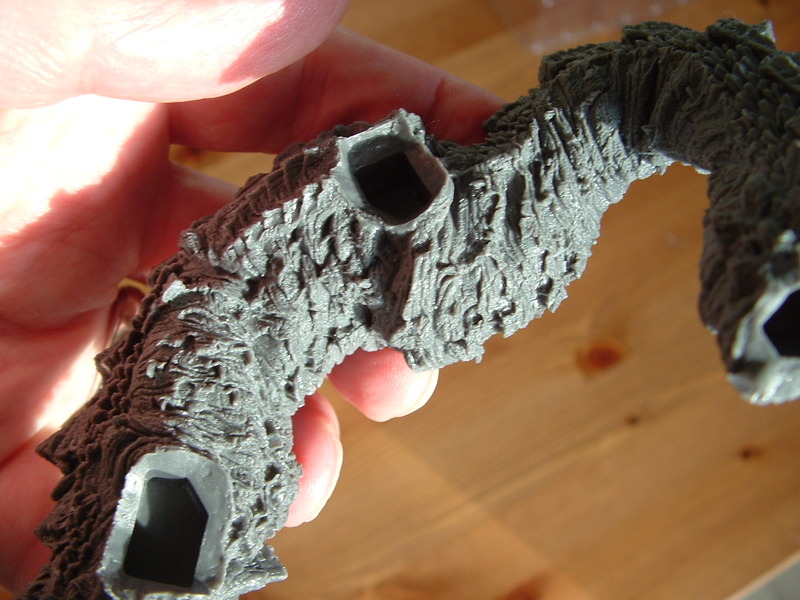 Some pieces don’t have obvious mould lines, though most can be found after a bit of squinting. The biggest body section has the only really bad mould line, and that’s going to take a couple of evening’s to clean up well. It’s not terrible by any stretch, and there’s no slippage – it’s just the most apparent on this model. I’m in two minds whether the detail is a help or a hindrance here. It’s probably going to hide mistakes on my part from anything but the closest inspection, though on the other hand it does make cleaning up and greenstuffing any gaps that much more fiddly. All told though, a nice bit of casting. 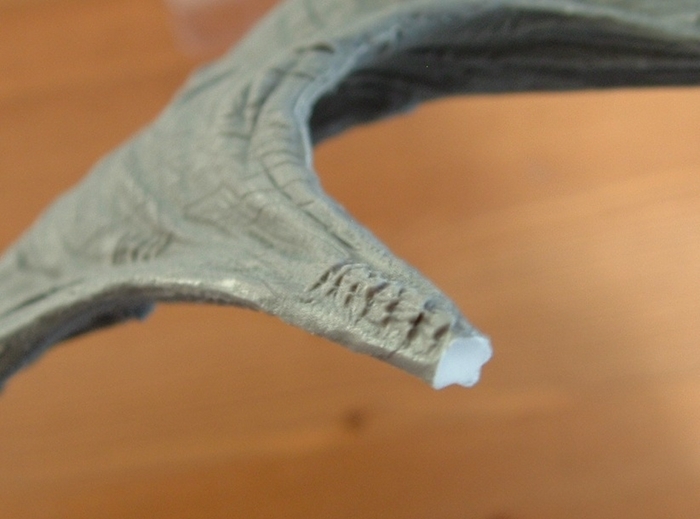 The teeth are really fine, and perfectly cast, but all different. No cosmetic dentistry here! You can see the difference in horn and scale texture clearly. You can also see his nostril. Inside his mouth you can see the tubes from which the flames emerge (and his asbestos tongue). Amazing detail. This last one is a view from under his chin. What else can I say? Oh, bubbles. With all the comments we get about Finecast and so on being full of bubbles, I had a really close look at this. At first I spotted that lots of the spikes that come in the little bag (on the left of the photo above) and go onto his back have bubbles. Then I looked closer. Actually I think it’s detail, and not bubbles at all. To start with, they’re the only thing with these holes in, and they form in little rows of 2 or 3. I eventually decided that it’s another type of texture that’s just slightly different from the horn or claw (which don’t have this pitting). I carried on looking, and eventually found one thing that I could convince myself might really be a bubble on the casting block of the head. So even if it is a bubble, it’s irrelevant. Chalk up another plus for Legacy Miniature’s casters. So there you have it. 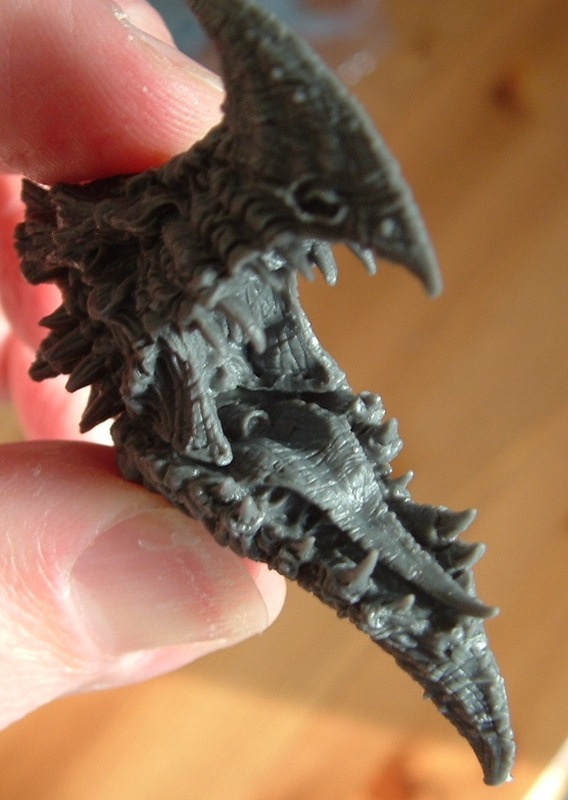 A beautifully sculpted and well cast monster of a piece from Legacy Miniatures. It’s going to take ages to assemble because I’ll take my time to savour it. It’ll also give me time to consider what colour I want to paint it. I quite like the idea of a more naturalistic reptile colour scheme, but it’s so big someone would just think I’d got a pet chameleon. On the other hand I sometimes think that he’s a fantasy creature and so deserves something colourful and dramatic. Still, that’s a consideration I can mull over later. What do you guys think? 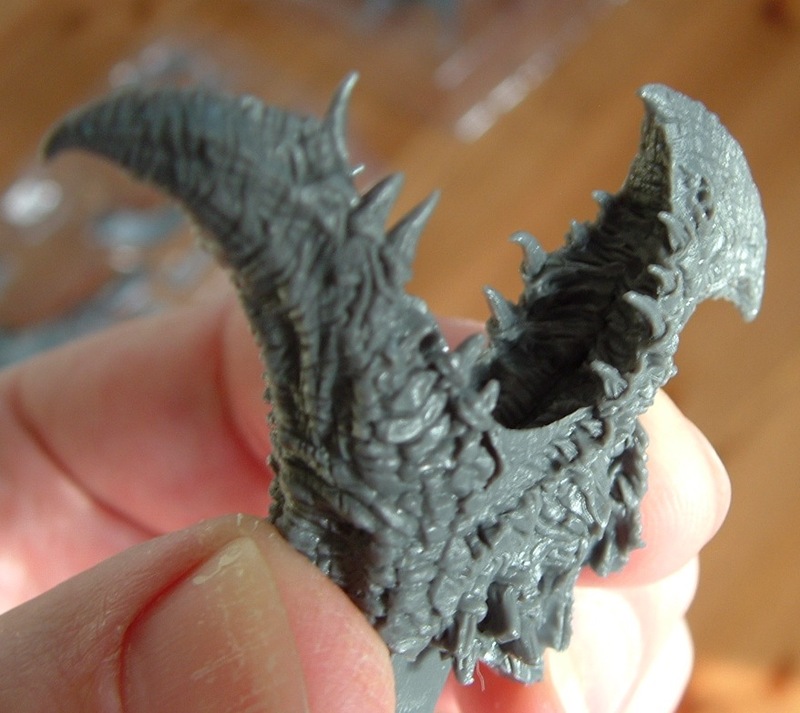 This entry was posted in Figures, Painting & Modelling, Review, Tabletop gaming. Bookmark the permalink. Great review! 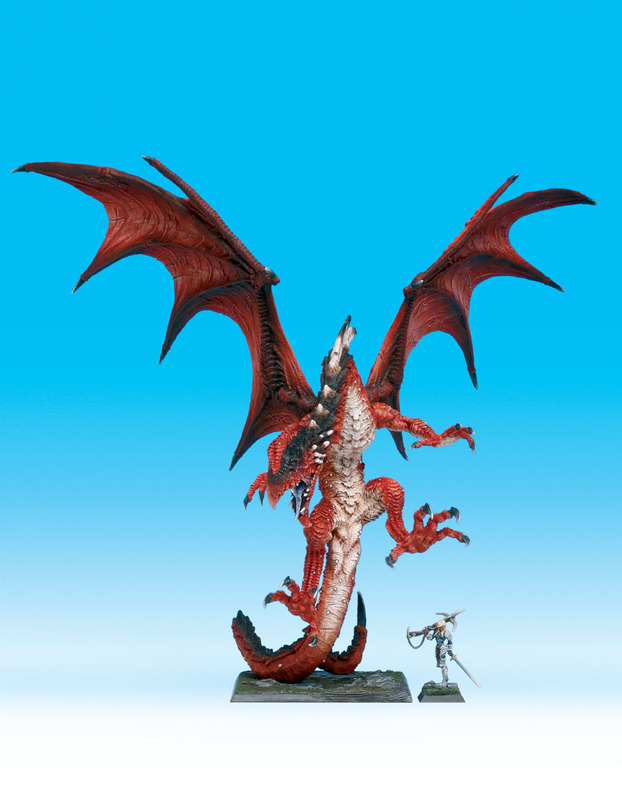 It’s a magnificent-looking piece, but I confess that, if I were in the market for huge dragon, I’d probably choose the Heresy dragon, the CMON Cang, or FW great fire dragon over this one. Hi Robey! I looked at all those (and many more smaller ones), and I’ll tell you why I chose this one. 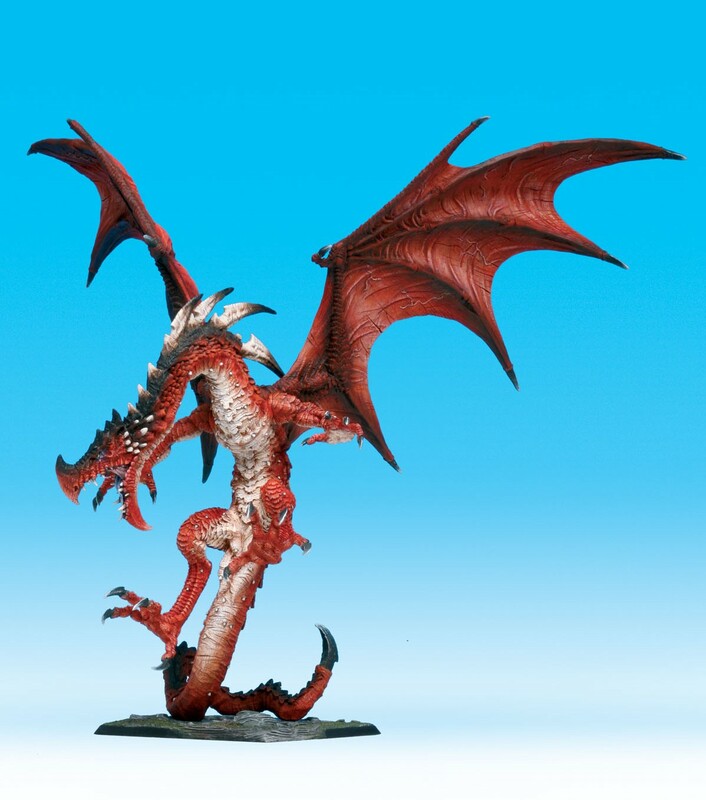 The Forge World Fire Dragon is nice, though I’m not very keen on the pose. I’ve not had a chance to compare it close up unpainted (comparing painted to not is a bit unfair), but I think the detail is better on the Titan Dragon. It’s not horrible, or sloppily made, it’s just a bit, well, tame looking in comparison. The Titan Dragon pose says to me that you’re getting a facefull of fire, then he’s going to land on you and stomp your aches into the dust. And then he’s going to get really nasty. 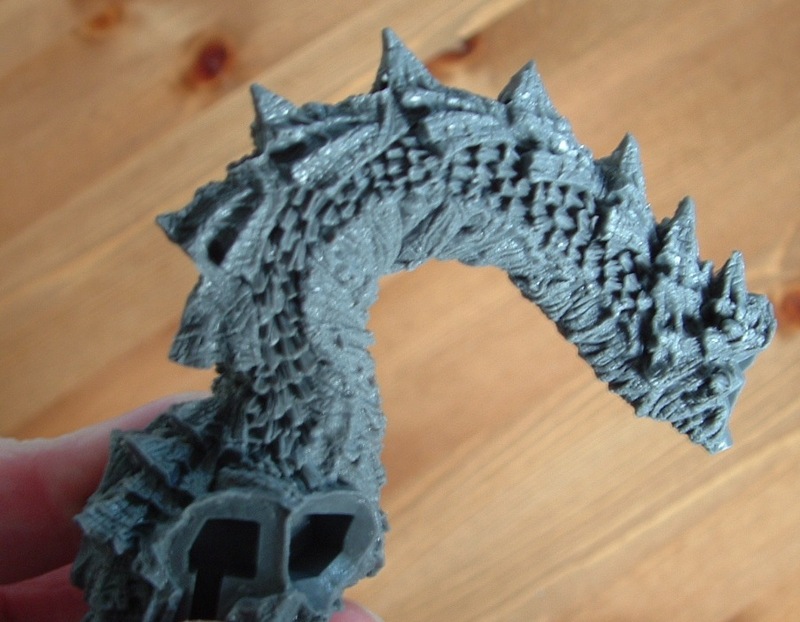 The GW Fire Dragon looks like it’s all a bit much effort. Whoosh there’s the fire, but the whole stomping thing was a bit last century, and can he just curl up with a nice virgin by the fire? The Heresy Dragon puts itself out of the running because he’s got so many people already waiting for one and is having production issues. Currently I’d be lucky to get one in the Year of the Dragon at all. It’s a lovely looking piece though (slight tail issues aside), with particularly nicely designed wings. Good luck getting hold of a Heresy one. He’s pre-sold 200 of them, and has only shipped out 27, according to the website. And I’d take a good look at the CMON one. I’ve had people comment that while it may look ok from a distance, the surface detail is pretty lacklustre. That was my point about the Heresy one putting itself out of the running. No matter how nice it is, you’ve got to stand in line behind 180 other people and they’re coming out at a rate of a dozen a month or less. I really hope he can get his production sorted out, cos I would like one, but I can’t afford to pay him the money now on the offchance I get one in 18 months time. I’ll have another look at Cang. 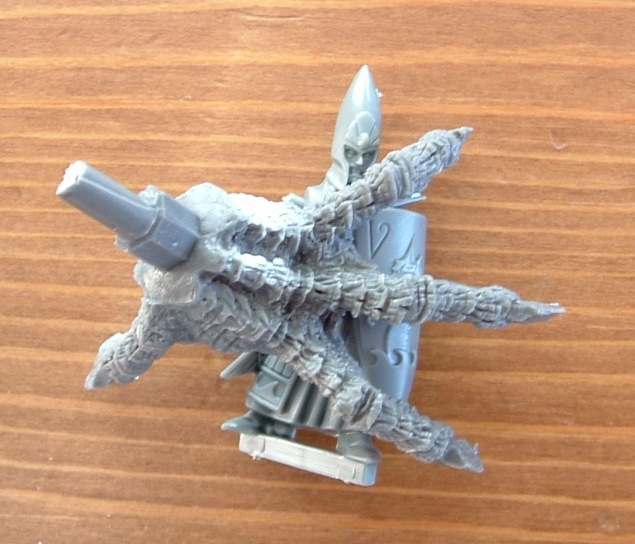 I would quite like a Flesh Golem, but the Hydra was further down my list just because of it’s points cost. The Titan Dragon will see use in other games, whereas the hydra is sort of obviously Mid-Nor. I did some maths and figured out that if I order now I would probably get it in 4-5 years. I am all for long term investment, but not this kind of. If you only had mentioned it earlier. I had like 3 of the Flesh Golems and sold two recently and kept one for myself. BtW, there are even moments when I am flabbergasted by what I see. That sign is so much fun that we will make one for our Fallout-game…. Oh yeah. This is good. I saw one of the CMON Hydras go past on Ebay. RRP is about £75. Ebay sale was for about £190. @ Sam – Taming Hydras is a long and dangerous business. You can’t restock overnight! Maybe I should photograph my John Howe picture of this big beasty and send it to you? Hes got some nice pastel colors on it. 😉 And don´t say pastels look strange on dragons, they looked fine on the little one. Holy Moly… I am insanely jealous ! Take care of that beauty and do justice to it… And think of me if you decide to sell one day ! I hope I never have to sell this. It’s an amazing beastie. It is also, incidentally, probably the single most expensive gaming anything I’ve ever bought. I’ve got too much of my own awesome stuff at the minute to be more jealous than I am. Still I wouldn’t leave its box near me unattended… just saying! lol. I’m glad to hear it’s well cast, as that seems to be the one thing Legacy have gotten right (other than bringing back the range at all). So far we have had an almost random collection of extremely expensive, limited edition figures, with multi-packs of models not all of which you would want. And no sign at all of them trying to bring back a coherent range of any of the rules. 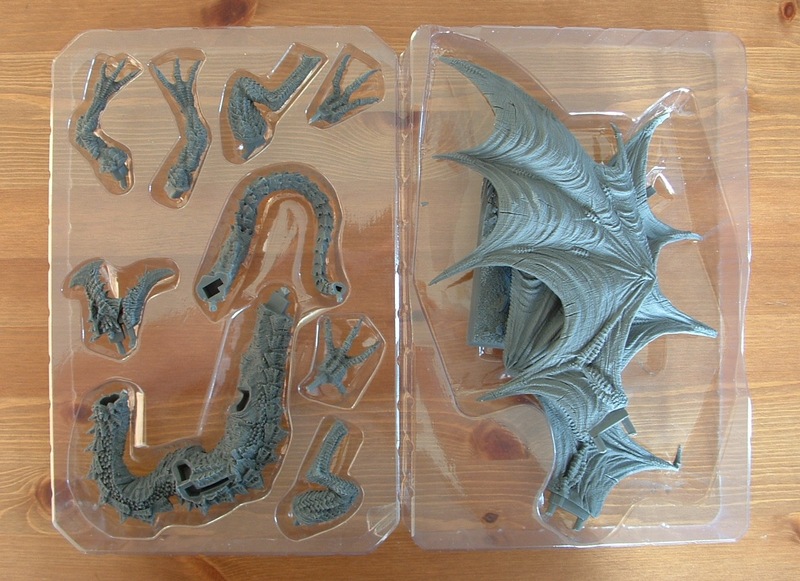 And now they’ve decided to release a model intended to be pre-painted plastic in resin. You’re right, it has seemed more than a little haphazard, but I think we should perhaps be grateful that anything’s available at all (apart from Chinese knock-offs). The Griffin is a curiosity. I’d not seen it beforehand and have heard conflicting reports on whether this was based on the master for the plastic or something else. I think Elro may be getting one, so we’ll have to wait and see what he thinks. What a fantastic looking mini. Oh if only the game could live again. I would not attempt to paint such sweet mini. I’d ruin it LOL. I haven’t seen any official word from Legacy about whether they’re seriously looking at redoing the game, nor is it entirely clear who actually would have the rights to do so. The computer game rights are clearly not theirs, and depending on how the IP was sliced up that may have carried the game rights in all formats. Who knows? André? Of course, even if they do have the rights, they also need the capital and the inclination. The latest owner of the rights is the same company that is doing the computer game. Thanks André. Do you know if they licensed Legacy to do the figure game as well as the figures themselves? Only the minis and since Legacy is somehow connected to Dust Studios and since Paolo is preparing his own fantasy-game I don´t see Legacy doing the rules in the forseeable future. I can also think of a couple of spells that might give it a bad day, but we’ll have to see. It’s been a while since I played Conf so I’d have to get my head round the fiddly bits again, but well worth the effort. Hm… I might bring my Dirz Beast with me so we can do a size shot ;). That would be cool. I don’t think I’ve seen a pic of them side by side. Hi, sir, i just found out this website and it is is cool, i would like to ask, can i take your dragon picture for my school project, please? and ideas, a whole lot details and also inspiration, each of which I would like, as a result of provide this type of tips here.